Francis Rogallo had invented his 'Rogallo Wing' in 1945 and worked privately on the design for the next 13 years. As part of the Space Race in the late 1950s, the design was brought into USA government agencies and further developed to investigate its value in delivering capsules back to earth with much greater precision than the existing round designs. 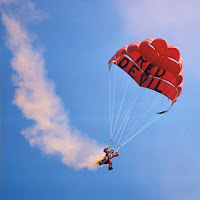 As you will be aware the space program did not utilise the Rogallo wing for capsule recovery, but the knowledge gained from this research was utilised by the parachute industry to develop flexible wings to deliver both skydivers and military personnel and payloads with greater precision. 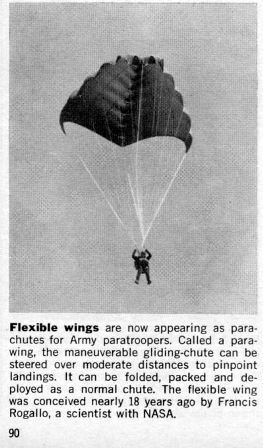 It is certain that without this development the sport of parachuting would have been a lot slower in developing gliding canopies, if at all. Pioneer and Irvin, amongst others, both developed designs and Irvin introduced several in the sport of parachuting. 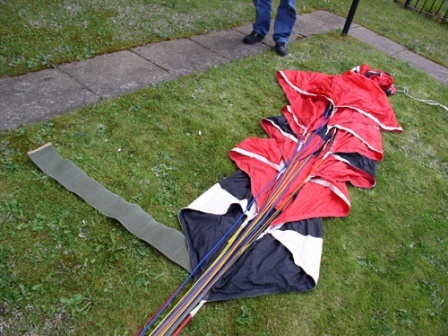 The Rogallo Wing was and still is commonly used on hang-gliders and kites. Irvin’s Eagle model morphed into the Delta II Parawing as the first commercially available parawing. 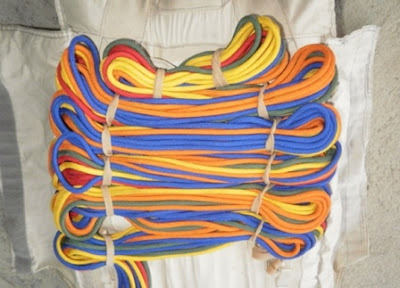 Multi-coloured rigging lines to assist with the packing sequence. 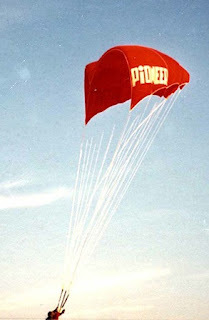 The Delta II Parawing had a unique reefing system known as an “Opening Shock Inhibitor” as well as multi-coloured rigging lines which helped the packing sequence. 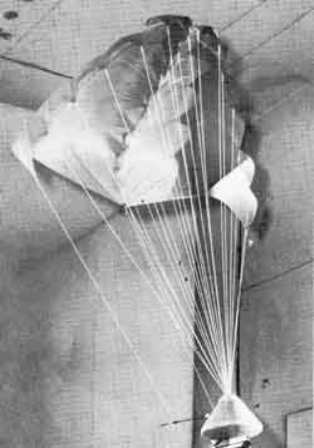 The OSI was intended to retard the opening forces during inflation. A similar function to a modern day slider, but designed long before the slider had ever been thought of. Steve Snyder helped develop the OSI and ultimately also contributed to the development of the ram-air slider. It consisted of a long and heavy duty cotton strap which was rolled around groups of lines during packing. The sequence of lines was critical hence the colour coding of the lines to help this process. The OSI was locked shut with a Velcro tab which was attached to the OSI “rip line”, which itself was attached to the front or “nose” of the canopy. 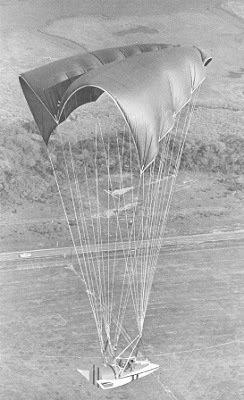 The idea was that on inflation the nose of the canopy released the Velcro tab on the OSI and the wrap could unfurl as the canopy inflated and expanded. 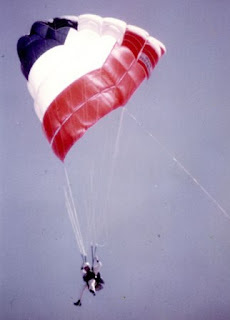 "OSI around lines, note the white rip line which releases the OSI on canopy inflation"
I owned the first Delta II Parawing sold in Texas (red & white checkerboard design)purchased from McElfish Parachute Service in Dallas. It was a real adventure to jump. Made my 1st through 5th at Seagoville, TX. 1st was great, gentle opening, flew beautifully, made the peas, Nice. 2nd jump, slow opening, otherwise OK. 3rd jump a total streamer and cutaway. 4th, incredibly hard opening. Saw stars, ya ha! 5th (a week later) malfunction..cutaway. This is getting old. 6th and 7th another week later. Hard openings, really knocked the snot out of me. Kept reviewing packing..all seemed by the book. Jump # 8 through 11, smooth openings, alls well. Maybe I've got this thing down. Jump 12, hard opening, two burned panels. Two weeks later Jump 13, partial malfunction, spinning, another cutaway. End of story. 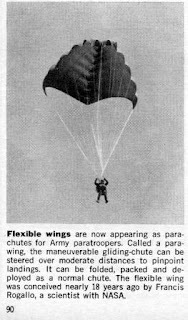 Sold canopy to soldier at Ft. Hood. Bought new PC and started having fun again. You either love or hate these canopies, I must say it has quite a reputation and not a good one at that. Thanks for your post much appreciated. 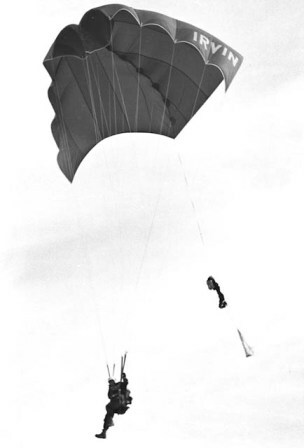 One large or two small pilot chutes did the air anchor duties, as the jumper fell several feet away. 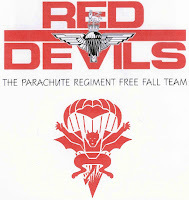 I had one I bought in 1978 while serving at Camp LeJeune. I borrowed a large backpack and front mount reserve to make jumps with it. After 2-3 successful jumps I had two malfunctions and cutaways in a row. On the first of those two I couldn't get the reserve handle to budge and fell back to earth to a very low altitude before I could deploy the reserve (26 ft. Navy conical with 4 line release steering) and by the time I released the 4 lines I was in the trees. 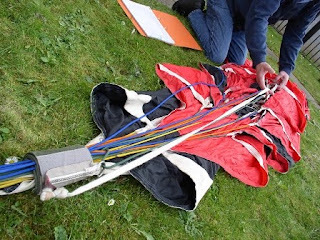 After paying for repairs to the reserve canopy I tried again but after that malfunction I put it away. I still have it and it is in almost brand new condition. @ Daniel Henshaw, would you like to sell it to me? It would be coming to a good home.